A fully grown lunestre dragon is not much larger than a hand span, which may fool some people into believing they are weak. Although they appear to be pretty and delicate, these companions rely upon their magic to give them strength. A lunestre dragon can travel alongside their magi for hours before needing rest, and when they do, they just settle down on a cloak. They also possess keen eyesight, and are able to pick up heat in the dark. As hatchlings, these companions move little and eat lots. Once they have grown into adults, though, they are much more active, eager to try out their new wings. Then they are excited and begin hoarding things, and flit around The Keep while looking for trinkets to steal. Like other dragons, these tiny beasts love to hoard things. Although they do not create nests, lunestre dragons have found a unique way to secure their treasures. In the top of trees one can sometimes catch a glimpse of something shining, something metallic. A closer inspection will show it is a small hoard, comprised of whatever tidbits catch a lunestre dragon's fancy. These objects usually include pretty rings and beads, and the occasional bit of shiny cloth. The dragon hangs them in trees with bits of string, and carefully look over their prizes. Anyone trying to retrieve these items first has to climb high up on very slender branches, and then fight off an angry little dragon. Although they are small and slender, these beasts can call upon flame like their larger brethren, and snap at them with sharp teeth. Lunestre dragons are unique little creatures. Though they share the same skills as other dragons, they hardly resemble them. These companions are small, fragile, and shy. If not for their magical powers, it is unlikely they would be stronger than a common butterfly. 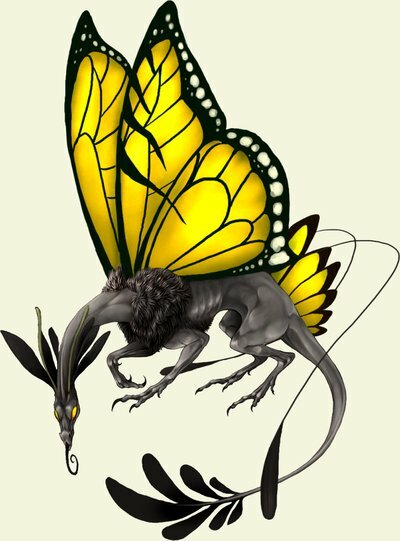 While non-magical butterflies are often devoured by owls and the like, lunestre dragons fend off enemies by breathing fire. These flames are incredibly hot, and some very interesting uses have been found for them. A few students discovered that unlike large dragons, lunestre dragons could direct their flames very carefully, aiming at one specific area. This process melts metal rapidly and is much more effective than a forge. As for the dragons, they enjoy helping their magi and are always eager to help. These activities generally take place during night, though, as these companions are nocturnal. Lunestre dragons hide away and sleep during the day, but appear at dusk, snatching up insects as meals and flying very high up. No one is quite sure why lunestre dragons love to try and fly above the clouds, though there are many theories. Some wilder ideas claim these companions are from the stars, and try to follow light to make their way back. Though this seems a bit ludicrous, these creatures are strong fliers, and often fly farther than most would think possible. They rely on magic to keep them airborne, as strong winds would buffet them about otherwise.